You can get if for FREE with a $100 purchase or at a discount. I spent last weekend at Petticoat Junction scrapbooking with friends. It was SO much fun! 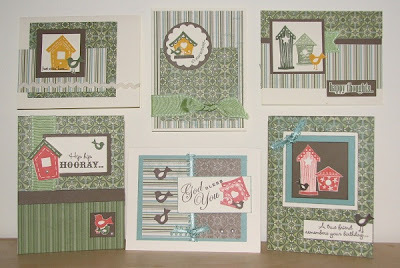 I brought along 4 of the new Workshop on the Go Kits that I wanted to work on - Mayberry, Miracle, Fanfare and Sweetheart. 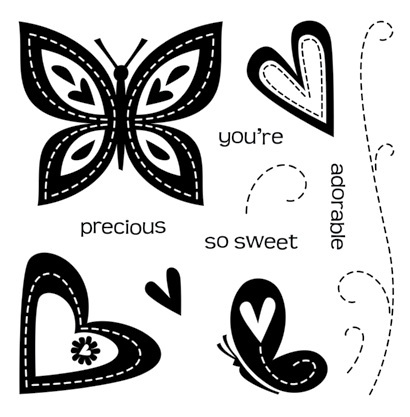 I could not wait to do the Sweetheart kit because I had some great pictures from my daughter that I wanted to use and also the kit included these REALLY adorable black polka dot epoxy stickers. I used the new Pennant Alphabet (E1018) stamp for the Title. Ink colors used with this kit were Black (Z2105) and Cotton Candy (Z2193). Here is the feature layout for the Sweetheart WOTG kit. The complete cutting guide and step by step instructions for this layout are included in the kit along with Sweetheart epoxy stickers! All this fro just $29.95. Now, THAT is a deal! I also created this optional layout. The layout is from Jeanette Lynton's How To Book - Magic. There is hidden journaling behind the picture on the right hand page. I used one of the epoxy stickers for the pull tab. The stampset included in the kit is just so cute! You can't order this stampset from the Idea Book - you can ONLY get it when you purchase the Workshop on the Go kit. Big Red Scraps is Giving Away Blog Candy! I just returned from my weekend retreat at Petticoat Junction on Sunday and we had a BLAST! The weather was wonderful (no blizzard to deal with this year) and the food was delightful (as always!). The weekend flew by so fast and it was hard to believe that it was time to pack up and get back to our busy lives. I think I accomplished nearly everything I planned to. I completed the layouts from 4 of the WOTG kits - Sweetheart, Fanfare, Miracle and Mayberry along with cards from the kits. I'll be sharing those in the near future. I think the most pages completed by one of the retreaters was a whopping 52!!! WOW!!! Way to go Sue! This year I wanted to do something fun with the ladies so I had a little card challenge. I provided four card patterns from Jeanette Lynton's How To books - Wishes and Originals and also Close To My Heart paper samples from the past several years. The ladies were to choose a card pattern and create a card using the paper samples. They had until Saturday night before dinner to make their card. 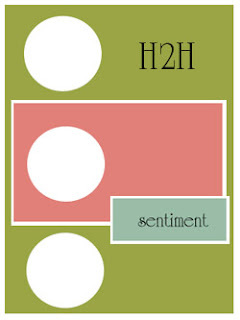 After dinner, Bonnie, our wonderful Retreat Hostess at Petticoat Junction chose three cards. It was a hard choice and I was so glad it wasn't me choosing! The cards were ALL beautiful. Check out all of these great cards! If you are looking for a great retreat check out Petticoat Junction in Normandy, TN. I had my own little card challenge here at the retreat. Be sure to come back Monday to see pictures of all the cards made by the wonderful ladies at the retreat! Today I'll be heading to Normandy, Tennessee for a retreat with 15 other ladies at Petticoat Junction. What better time to blog about packing! I was going to give a few pointers and tips for packing for a retreat without feeling like you are packing up to move! But when I finished, I STILL feel like I'm moving. First I began deciding what projects I was going to work on. 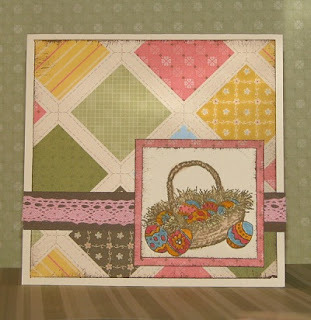 I wanted to complete 3 of Close To My Heart's newest Workshop on the Go kits - Fanfare, Mayberry, and Sweetheart. I also want to make a gift set of Thank You cards. So, I pulled out my WOTG kits, the new Creative Basics Wings Collection and a set a Colonial White Bulk cards. 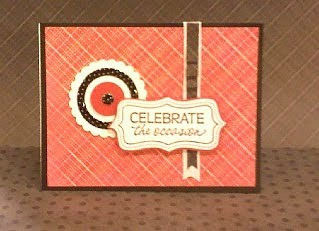 I LOVE the kits because they include the stampset I will need, coordinating embellishments and Instructions! I put the pictures I plan to use inside the kits. That was easy! Then I needed my inks..... I might as well take them all! I love to share and someone might need a color so I have this really cool ink organizer from Close To My Heart. All the ink pads and markers fit snug in the case. The handles on top make it easy to carry. For EASY transport I also have the Ink Organizer Carry Case. It has a panel on the back so that I can slip it right over the handle of my tote and wheel the whole thing where I need to go. I added the re-inker tray that fits just right on top of the ink organizer. It holds my essentials. So, I have my kits, my inks and markers and other essentials. What else do I need? OH! I have to take my newest CTMH Idea Book along with a scrapbooking magazine or two to read. And those energy booster favorites - Diet Coke, M&M's and Skittles. I have just the tote for this! It the fabulous periwinkle/black CTMH Shoulder tote! Looking good! I've got kits, inks, ideas and energy. Am I done? NO!!!! As the host consultant, I bringing all my stamps to share with the retreat gals (see the tall 5 -drawer tower), Cardstock (you never know when you might need an extra color) and of course, I've got some orders to bring along tucked into my big Convention tote from last year's convention. Then there is my scraps, my tools, extra adhesive (enough for me and my guests). The big rolling tote has boxes of accessories, paper trimers, punches, blocks, Gypsy and more. WOW! That nice neat little pile of three items grew into a huge mound. Oh well..... I tried. I'll let you know my new address when I get there! Have a great weekend everyone! When I get back I'll post some of the projects that I worked on! H2H Color - Anything Hearts! As much as I have been enjoying participating in the H2H Challenges, I really did not intend to participate this week. I'm leaving for a scrapbooking retreat on Thursday and I've got sooo much to get done before I leave, I didn't think I'd have time to make something. One of the items on my TO DO list was to make name tags for the attendees. We've got 16 gals (including me) going on the retreat and not everyone knows each other so I wanted to make name tags. The name tags needed to be fairly simple due to the number I needed to create and the amount of time I have to do it. The weather this week has been so spring-like that I wanted something fresh and new! So I chose paper from the Miracle paper pack from our new Spring Summer Idea Book. I printed out each name on my printer using the Close To My Heart Font - CTMH Girlfriend. (was that not appropriate?!) 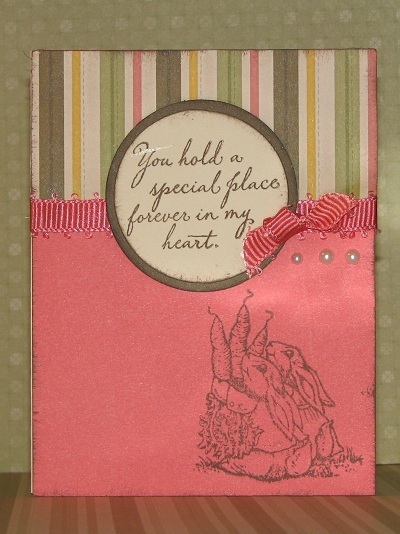 I used the stampset that is included in the Miracle WOTG kit and added a bitty opaque pearl to the heart. Interested in where we are going? We are going to Petticoat Junction in the small town of Normandy, Tennessee. We went last year and had a great time! Want to find out more? You can go to the website here. It's A Card Chatter Workshop! When I saw the new 2011 Spring Summer Idea Book from Close To My Heart I knew that somehow I had to fit a card workshop into my busy schedule. The new stamp Bless This Nest was perfect. Plus we have two new Card Chatter stamps. One for birthdays, and one for sympathy/thinking of you. I couldn't wait to start designing my cards. I had help with my designs - one design was from Mojo Monday and one was from the H2H Challenge that I have been participating in each week. (They are alot of fun and really get your creative juices flowing). 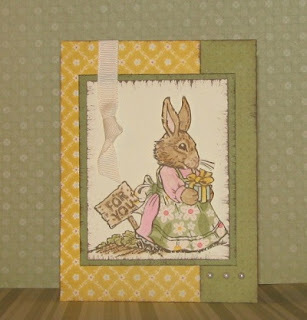 The other card designs are from Wishes and Originals - two great How To books on cardmaking by Jeanette Lynton. My Card Chatter workshop is offered on two different dates - March 10 and March 12. Both classes are nearly full but I do have a few spots left! Cost is just $9 to make all six cards with envelopes and includes the use of my stamps and inks. Everything is pre-cut for you and all you need to bring is scissors and adhesive! If you want to reserve a spot in this workshop, contact me today! Today is my oldest daughter's Birthday. I still can't believe that she is 21! Where did all the time go? She has grown into a beautiful young woman and I wanted to make a card for her that reflected the beauty that I see in her. I didn't have to go far for a design because this week's Mojo Monday was a perfect design. The stamp I chose was Be Yourself. I love this set of 8 stylish silhouette girls that reflect a carefree flare. The phrases on this set - One of Kind, Be Yourself, Confident, Beautiful - all describe Kirsti. The rose highlighted by green sparkles represent Kirsti growing into a beautiful woman that lights up a room with her smile. May you stay beautiful & confident because you are Truly One Of A Kind! This week's H2H Challenge was all about kissing! Have you ever kissed a stamped? I have and its lots of fun! I'm not talking about litterally kissing my stamps (although, there are some that are so cute - you almost want to when you get it!). Over on the H2H Challenge blog there is a great video tutorial by Tresa Black on the different variations of stamp kissing. I did the simple kiss which basically uses 2 colors of ink, a solid stamp and a stamp with a design on it. 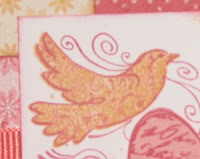 For my card I stamped the solid bird stamp in Goldrush ink and the Heart stamp in Tulip ink. (I used this same Heart stamp for the heart on my card) I set the Heart stamp ink side up on a solid surface and 'kissed' my bird stamp to it. Almost like stamping the bird on top of the heart. 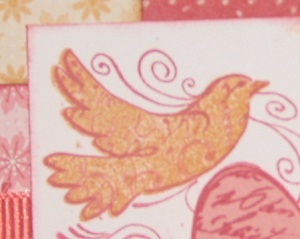 I then stamped my bird onto the white cardstock. You can see where the Goldrush ink picked up the design of Tulip ink. Be sure to check out the other Kissing techniques on the H2H blog. Just click on the H2H badge to the right! This month's workshop is Sophia. I have already been working with this kit and unless you haven't been reading my previous posts - you know how much I LOVE this paper! I love the stampset with this layout - the birds, the flowing vines of flowers.... it just reminds me of the spring that I think ALL of us are longing for during these long winter days. The scalloped edge in the blush cardstock was made using the corner rounder once I removed the guard. This is such a neat trick! This kit comes with the Pink Assortment of buttons. Some are round and some look like flowers. They are so pretty and there are plenty of them so I didn't mind using them all over my pages. (remember, I'm an Embellishment Hoarder). The optional layout instructions can be found on my website by clicking on Workshops on the Go. You will need the Magic Book for the cutting dimensions but all the other instructions are there. This layout was easy. I couldn't resist digging out the old Easter pictures for this paper. I had to laugh when my daughter (she's the baby in the picture but is now 16) asked why in the world we bought those dresses! Well - it WAS the style in 1995! I did make the cards in this workshop kit too. They are beautiful! If you are interested in attending my workshop on February 24th (Thur at 6:00 pm), please contact me by February 12th so we can order your kit! This kit can also be ordered right from my website. Sophia WOTG is Item #G1019. Mojo Monday's sketch was using a non-traditional size card. We could do either a square card or a round card. I chose to do the round card. I loved the way the little flowers lined the edge of the outline in the center of the card. I wanted to include this in mine but I just loved the stamp I used and I didn't want to totally cover it up. I used the reverse side of the Miracle B&T paper - from our new 2011 Spring Summer collection. I used tulip paper flowers and butterfly for a pop of color. More Mojo Monday Cards on the Mojo Blog. Just click on the Mojo badge to the right! Be sure to check out the H2H Challenge blog for other great artwork. Check back later this week for my Mojo Monday entry!